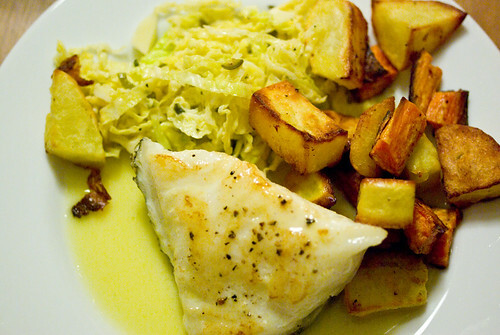 This was dinner last night: Chilean sea bass* in a sour orange beurre blanc, potatoes and sweet potatoes roasted in olive oil, and sauteed cabbage. The cabbage was actually a slaw left over from our shrimp tacos the previous night, marinated in lime juice and serrano chiles, but tossed in a hot wok it was really delicious, especially with the beurre blanc. 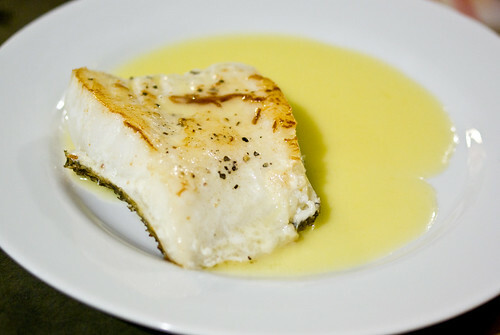 This was my first time making beurre blanc, and I didn’t even realize that’s what I was doing until I was halfway through it. I was following a recipe in Moro East and wasn’t quite sure if it was working correctly, so I referred to James Peterson’s Sauces and saw that I was basically approaching it the right way, just with some unusual seasonings. The recipe uses Seville oranges, but allows substituting a mix of lemon and orange juice if you can’t get them. I combined the juices in a small pan, added a bay leaf, some thyme, finely grated orange zest and a sprinkle of cinnamon, heated it all to a simmer, and whisked in an improbable amount of butter. The sauce wasn’t particularly thick, but it didn’t break, and it had a wonderful tart orange flavor that went gorgeously with the fish and cabbage and sweet potatoes. Not an every day sort of sauce, but nice to know how to do. 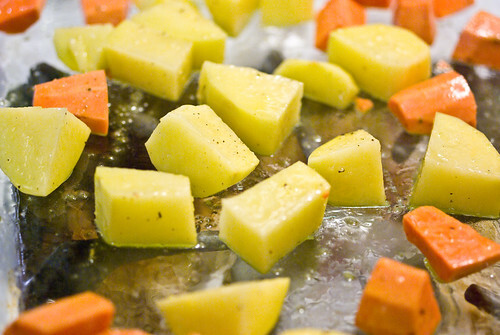 you had me at potatoes and sweet potatoes roasted in olive oil. i somehow stumbled across your blog, i am delighted that i found it! p.s i love pakora and samosa, you made it sound a lot easier to make it than what i was imagining. i can’t wait to try it out of one of these nights. Hi Sasha, glad you found the blog! I usually roast just potatoes or sweet potatoes separately, but this week I only had one of each so I combined them. Worked great! They get crusty on the outside and creamy inside, and you can add just a sprinkle of salt and pepper at the beginning or smoked paprika at the end. It’s important to use a big enough pan so the pieces don’t touch each other too much, otherwise you don’t get the fabulous crusty bits. I never get tired of them.